With the unveiling of the new Vision Maybach 6, Mercedes-Benz reinterprets the futuristic style of the coupe, with a classic twist. The luxury car was introduced at Monterey Car Week in August, and is expected to be released in 2017. Undeniably eye-catching, the 18.5-foot-long Maybach 6 is more than meets the eye. The sleek exterior design offers proportions that give both a glamorous and striking appeal. The long nose, low roofline, and short rear of the coupe “recalls a luxury yacht,” while the red paintwork represents a classic feel with contrasting silver accents throughout. According to Mercedes, the redesigned grille was inspired by a pin-striped suit. 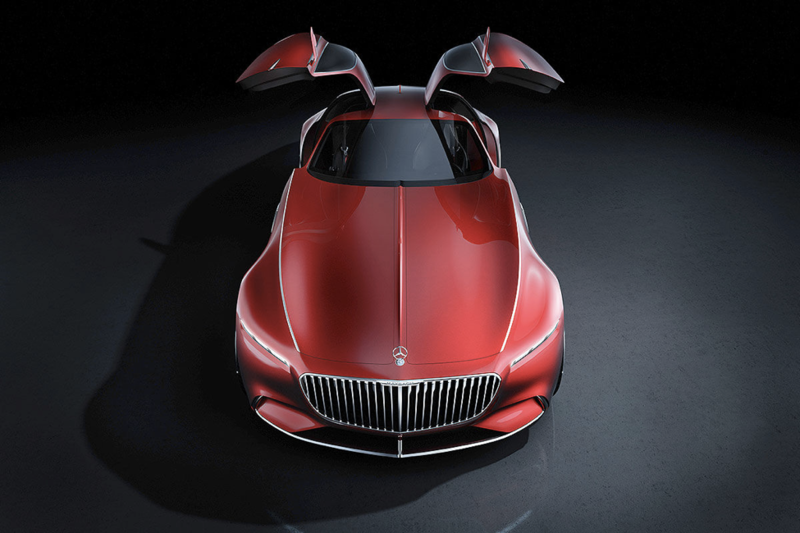 Additionally, the gullwing doors add to the futuristic design of the vehicle, and open up to a 360-degree lounge interior. 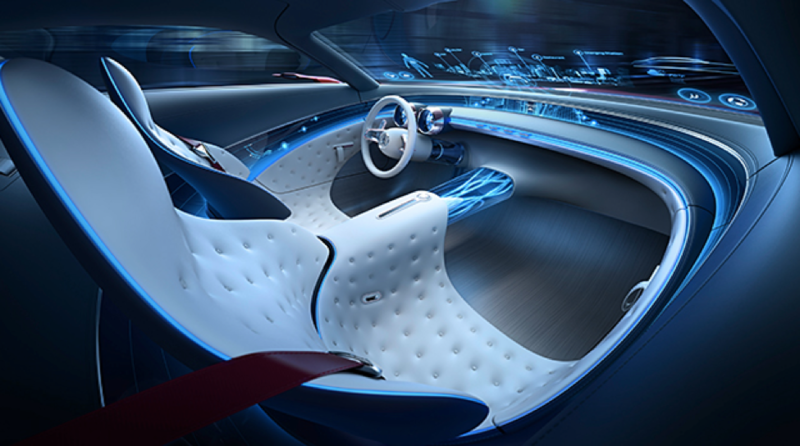 The two seat interior is surrounded by a curved dashboard, which continues alongside the doors, and again around the seats, giving occupants the ultimate lounge experience. The white leather pairs well with a light grey elm wood trim, giving simplicity to the fully digital control and dash display panel. The transparent projection of the controls and data are presented across the entire length of the windshield. Using gestures, the occupants of the vehicle can adjust the controls of the car. As expected, there are features that allow the driver to sit back while the car operates autonomously. “Our glamorous coupé, the Vision Mercedes-Maybach 6, represents the ultimate in contemporary luxury. It is hot and cool,” – Gorden Wagener, Head of Design at Daimler AG. The Maybach 6 is completely electric, with an electric motor for each wheel. It has an underfloor battery, and offers all-wheel drive. With characteristics of a typical sports car, it can go from 0 to 62 mph in under four seconds, and can reach speeds up to 155mph. The car can also be recharged wirelessly. 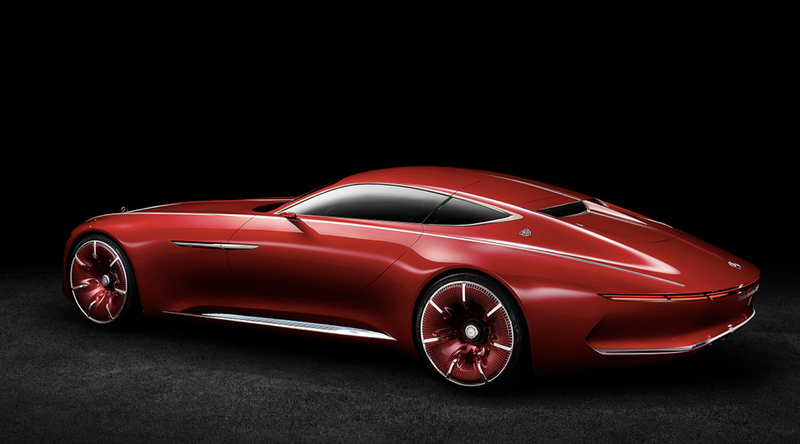 The Vision Mercedes-Maybach 6 has impressive design features and elements. It is estimated to be sold at a market price of about 300,000 US dollars. It is the first luxury coupe released by Mercedes-Benz, and hopefully not the last.